This video interview with Dajin Resources’ Catherine Hickson now includes a transcript. Take a read! 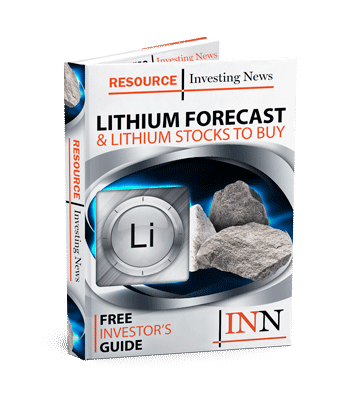 At this year’s Vancouver Resource Investment Conference, the Investing News Network was joined by Catherine Hickson, a world-renowned volcanologist and director of lithium junior Dajin Resources (TSXV:DJI,OTCMKTS:DJIFF). Dajin has a lithium project in Northern Argentina, where there are plenty of volcanoes, as well as another project in Nevada. As Hickson explained, there’s a very close connection between volcanoes, geothermal energy and lithium. Watch the video above to learn how they intersect. Dajin Resources is a client of the Investing News Network. This video is not paid-for content. INN: It’s so nice to have a world-renowned volcanologist post vote dealing between with human volcanoes. Can you explain that a little bit? CH: Yeah, it is actually an interesting connection. Well, it turns out that at least for lithium brine, there is a very close connection between volcanoes, geothermal energy and lithium. So the best lithium deposits are actually associated with volcanoes which have geothermal systems and produce lithium brine. INN: Okay. And what are some of the known deposits that were formed this way? CH: Well, actually Dajin, we have three properties and one of the important [points is that] we’re in Nevada as well as in Argentina. And what’s neat about the Nevada properties is there was a huge volcano – actually it’s called Long Valley caldera – and it erupted about 760,000 years ago. But it was an enormous eruption and that eruption was – actually so Long Valley caldera is in California, just across the border from Nevada. But it was a massive eruption. Cubic kilometers of material were spewed out and that ash was actually very rich in lithium. So it spread over Western Nevada, then with time, leached away. So the lithium that was in the ash leached away into the groundwater in these closed basins, or salars, where we find the lithium brines producing the brines. INN: Are all lithium deposits formed that way? CH: Well, no. The brines seem to be enhanced by volcanic ash, and that’s because the ash is very easy, it actually dissolves quite easily with water, releasing the lithium and then the lithium, so you have to have a closed basin. And that closed basin simply means that all the water drains into the basin and never escapes other than through evaporation. So over hundreds of thousands of years, it’s concentrated and it creates brine which are richer and richer in lithium plus other things like boron and potash and those kinds of things. So, there are other deposits of lithium that are not associated with brines. And these are what we call hard rock and they are minerals like spodumene and lepidolite, which still have an igneous origin in the sense that those are minerals are associated with igneous rocks, rocks which cool like granite deep below the surface, but they never made it out. INN: I see. Okay. And when you’re looking for new lithium deposits, what are some of the things that you’re looking for? CH: Well, we’re looking for the geothermal signature. So we want to know that there’s a geothermal feature in close association with the deposit. We also would like to see those volcanoes because they provide us with the ash, as well as a lot of broken-up material that forms a great, what we call an aquifer. And an aquifer simply being where the lithium, this fluid is actually held inside the salar. So volcanoes are good from lots of perspectives. INN: Yes. And they’re especially good for green energy now, apparently. So when did you realize that your interest in volcanoes and lithium would be impacted by this kind of revolution in green energy and energy storage? CH: Well, I started my career actually in geothermal energy as a volcanologist, because volcanoes are hot. They are a source of heat and so we have geothermal resources around volcanoes. So, way back when, I actually started doing exploration for geothermal energy. I then worked actually for the Canadian government for 25 years. And during that time, I did a lot of regional mapping, some geothermal. But in 2008, I left the public service and joined a company that did geothermal exploration. I did that for several years and then, through connections, was introduced to a company, Dajin, that had property in Northern Argentina. Lots of volcanoes, lots of ash, lots of lithium and geothermal. And I had actually done prospecting for geothermal energy in Argentina. So, it all kind of came together. And then, of course, it’s been a number of years there’s been increasing emphasis on lithium. But in the last year, with Elon Musk and the giga factory, I mean, it’s just really taken off. Fortunately, I was in it before it really took off so it’s kind of fun now. It’s a little bit of staking rush down in Nevada and whatnot, but I think we’ve got great properties because we were there before the rush. INN: Great. So, appreciating that you were there before the rush, and before it became a hot commodity, what are some red flags that investors can look out for in terms of geology? Because there’s a lot of companies out there right now? CH: There are a lot of companies. And we’ve seen a lot of staking. So one of the things is you need to actually be in at the marsh. Companies that have their claims on the sides, or around the actual physical area of the marsh are probably not going to be very prospective. So that’s definitely one hint. But the biggest thing is if it’s not on the flat ground, it probably is not going to have lithium. INN: Fair enough. Thank you so much for that, Cathy. CH: You’re most welcome. Thank you.